Coastal erosion study could hold valuable lessons for climate change mitigation. New research on how the Sussex coast has eroded over the last seven millennia could help provide an insight into how climate change might affect UK cliffs in the future. In a new paper published today in the journal Proceedings of the National Academy of Sciences, researchers from the Universities of Glasgow and Colorado, Imperial College London, the British Geological Survey and the Environment Agency describe how they have used a process known as cosmogenic dating to learn how the chalk cliffs at Beachy Head and Seaford Head have eroded. Cosmogenic dating allows scientists to use the build-up of a specific isotope of beryllium found in rocks at the surface as a kind of rock clock. As rocks are uncovered on shore platforms by natural processes such as erosion and landslides, these beryllium isotopes begin to accumulate due to exposure to cosmic radiation (the same radiation that causes the Aurora). Since the rates of accumulation are relatively constant, scientists can measure the rocks, current levels of beryllium to estimate how long they have been exposed near the surface. Measuring rock samples from across the shore platforms allows them to build a record of how coastal erosion has proceeded over the last 7000 years or so. Their results show that, after thousands of years of relatively steady erosion of between two and six centimetres per year, the rate has increased dramatically over the last 200-600 years to between 22 and 32 centimetres each year. The researchers speculate in the paper that the increase in erosion could be down to the beaches being gradually thinned out over the last few hundred years at both sites. While sandy beaches can act as a protective barrier between the sea and cliffsides, when they are thinned by alongshore transport, protection is lost and the remaining loose beach material can wear away the cliffs faster, increasing the rate of erosion. Dr Martin Hurst of the University of Glasgow’s School of Geographical and Earth Sciences said: “One of the challenges of monitoring coastal erosion is that useful historical record only stretches back 150 years or so. Cosmogenic dating gives us the opportunity to roll back the clock much further to make more informed observations about the past. “What we’ve seen in this case is that the rate of erosion has taken a big leap in the last few hundred years, which we think could well be due to the thinning of beaches. 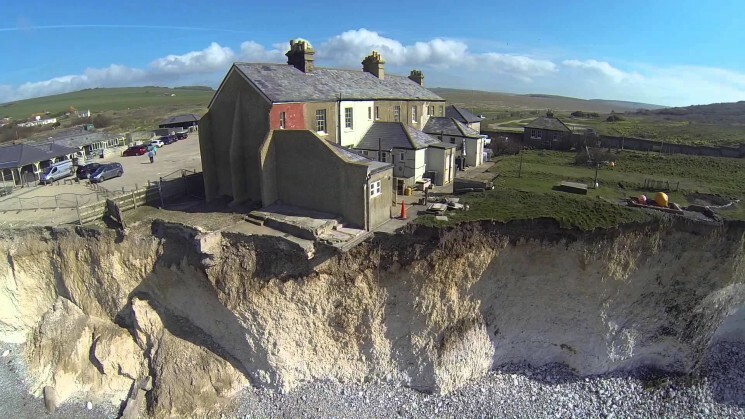 “As the effects of climate change are increasingly felt through rising sea levels and increasingly regular severe storms, it’s likely that similar thinning could well take place elsewhere in the UK and abroad, quickening the pace of coastal erosion. The team’s paper, titled “Recent acceleration in coastal cliff retreat rates on the south coast of Great Britain”, is published in the Proceedings of the National Academy of Sciences and is available online.